NOTE: By default, the REST endpoints (administration, management and health), as well as the Dashboard UI do not require authenticated access. By default, the dashboard, management, and health endpoints use HTTP as a transport. You can switch to HTTPS easily, by adding a certificate to your configuration in application.yml. As the default port is 9393, you may choose to change the port to a more common HTTPs-typical port. The alias (or name) under which the key is stored in the keystore. The password of the key. The password of the trust store. If HTTPS is enabled, it will completely replace HTTP as the protocol over which the REST endpoints and the Data Flow Dashboard interact. Plain HTTP requests will fail - therefore, make sure that you configure your Shell accordingly. -dname "CN=localhost, OU=Spring, O=Pivotal, L=Kailua-Kona, ST=HI, C=US"
CN is the only important parameter here. It should match the domain you are trying to access, e.g. localhost. This is all that’s needed for the Data Flow Server. Once you start the server, you should be able to access it via https://localhost:8443/. As this is a self-signed certificate, you will hit a warning in your browser, that you need to ignore. In case you run into trouble establishing a connection via SSL, you can enable additional logging by using and setting the javax.net.debug JVM argument to ssl. Enables basic authentication. Must be set to true for security to be enabled. (Optional) The realm for Basic authentication. Will default to Spring if not explicitly set. Current versions of Chrome do not display the realm. Please see the following Chromium issue ticket for more information. In this use-case, the underlying Spring Boot will auto-create a user called user with an auto-generated password which will be printed out to the console upon startup. Please be aware of inherent issues of Basic Authentication and logging out, since the credentials are cached by the browser and simply browsing back to application pages will log you back in. If you need to define more than one file-based user account, please take a look at File based authentication. As of Spring Cloud Data Flow 1.1, roles are not supported, yet (specified roles are ignored). Due to an issue in Spring Security, though, at least one role must be provided. When the LDAP authentication option is activated, the default single user mode is turned off. For more information, please also see the chapter LDAP Authentication of the Spring Security reference guide. The REST endpoints are secured via Basic Authentication but will use the Password Grand Type under the covers to authenticate with your OAuth2 service. When authentication is set up, it is strongly recommended to enable HTTPS as well, especially in production environments. Must be set to true for security to be enabled. OAuth Configuration Section, if you leave off the OAuth2 section, Basic Authentication will be enabled instead. As of version 1.0 Spring Cloud Data Flow does not provide finer-grained authorization. Thus, once you are logged in, you have full access to all functionality. As a result you should see a list of available REST endpoints. Keep in mind that when authentication for Spring Cloud Data Flow is enabled, the underlying OAuth2 provider must support the Password OAuth2 Grant Type, if you want to use the Shell. Simply clone the project, built and start it. Furthermore configure Spring Cloud Data Flow with the respective Client Id and Client Secret. 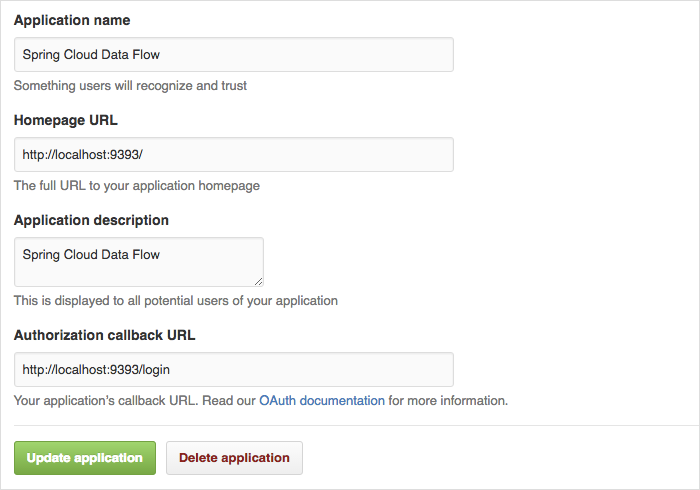 For the Authorization callback URL you will enter Spring Cloud Data Flow’s Login URL, e.g. localhost:9393/login. GitHub does not support the OAuth2 password grant type. As such you cannot use the Spring Cloud Data Flow Shell in conjunction with GitHub. If you don’t explicitly enable security for the management endpoints, you may end up having unsecured REST endpoints, despite security.basic.enabled being set to true.